The above info came from BH Ouji (aka Big Hamster), and was edited by yours truly (contact me). The image came from Izzy. 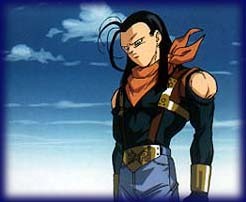 Super #17 is the fusion of two Android 17s combined together. Created by both Dr. Myuu and Dr. Gero, Super #17 is the ultimate Android around. His power is so great that no one can damage him. Thinking that Dr. Gero controls him, Pan prepares a surprise attack, but it is revealed that Dr. Myuu was the one who controls him. So then Super 17 "kills" Dr. Gero (if you ask me, Dr. Gero just went apart and was still alive, seeing as he was alive in Dragon Ball Z when Android 17 chopped his head off). When Kakarotto returns, he fights him, but Super17 could absorb any KI attack he made (including his 10x Kamehameha!). However, Android 18 came and orders Super 17 to attack where her bomb is (or was, as seen when Kuririn orders Shenron to remove the bomb from them in Dragon Ball Z). Dr. Myuu gets mad at Super 17 so he kills him, then Android 18 fires some KI and that gives time for Kakarotto to do a Dragon Fist and finish Super 17 with a Kamehameha!